My mother would often make this, not fully cooking the grain, and use it to stuff the Thanksgiving turkey. The excess would sit around the turkey in the roasting pan. At other times, she’d cook it as I do, in a skillet cooking to completion, and serve it as a side dish. and soak it overnight in water. Add the onions and cook until soft. After 5 minutes add the carrots and celery. Stir from time to time and continue to cook until most of the orzo have reached the color of chestnuts, a very dark brown. Don’t worry, it won’t taste burnt, and don’t wimp out and just have them lightly browned. This batch has a way to go… it needs to be much darker. 6+ cups of hot water. Reduce to a simmer and cover. Every 5-10 minutes check on the water level and the consistency of the grains. If it’s dry and the grains aren’t fully cooked, add water. When it’s done and the grains are easily chewed check the seasoning. Serve right away or let cool and reheat later. This makes about 10-12 cups depending on the grains you use. For a very large crowd at Thanksgiving I generally double this recipe. NOTE: Typically I’ve used 2/3 brown rice, 1/3 cup bulgur wheat, 1/3 cup whole buckwheat (kasha), 1/3 cup millet and 1/3 quinoa. You should feel free to experiment with the grains. 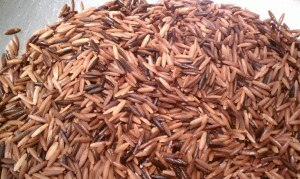 What I’ve learned is that white rice cooks a little more quickly than some of the others, so I prefer brown rice. Kasha has a strong flavor some people don’t like, although I prefer to toast the kasha in a skillet briefly after I finish frying the orzo; this enhances the flavor. I believe that using bulgur wheat causes the dish to be a little softer. I’m still playing around with this to refine the grain mixture.